find out what people are saying about Blue Chip Pest Control. If you have a pest issue then it needs to be solved as soon as possible or it will simply worsen. Use our handy, on-line form to request service today! We’re licensed, experienced and courteous professionals who love what we do. I am from Today Real Estate, Inc. and we have used Blue Chip Pest Control, Inc. for all the properties we are managing and have found their service very helpful and professional. They are extremely efficient and always on time. My clients and my tenants are satisfied with their excellent work, good prices and friendliness. I am very pleased with their work. I will continue to use them in the future and would highly recommend them to any company. Our satisfaction with your company has prompted me to write this letter. It is such a pleasure to finally find a company that provides dependable, quality service. You also guarantee all your work, which is most reassuring to the customer. We have been disappointed in the past with other pest control companies because of inconsistent scheduling, continuous price changes and less than satisfactory service. Carl has provided effective treatments to our home and yard and serves us in a friendly, professional manner. He is up-to-date with pesticides, regulations and safety measures ... especially when animals are part of the household. We are pleased to be associated with Blue Chip and look forward to continued service with you. I, as an Escrow Officer at Lawndale Escrow Company, have worked with Blue Chip Pest Control, Inc., on numerous occasions and have found their company, especially Chuck Chen, the manager, to be extremely efficient and trustworthy, in ALL of our business transactions. They have always done their work on time and in the few instances that we needed a RUSH, been right there to do the work and get us the necessary paperwork on time. I would recommend them in any instance for the job needed to be done. Your work with Blue Chip in servicing the association pest control needs has always been of the highest caliber. We feel that you have dealt with us fairly and with quick response. We want to commend you and your company for the excellent organization and performance throughout the entire process in the recent tenting and fumigation of the 68-unit community of Landmark Yorktown. Your company’s planning and communication with the Board and the Homeowners helped us to approach a complex project in a very positive and smooth process. Your assistance in making this process as understandable and non-threatening to the residents was much appreciated and of great help to the Board of Directors in gaining resident approval and cooperation during the planning and completion stages. We had not one complaint from any resident during the entire process, and there were a number of comments on the carefulness and neatness of the entire crew. We thank you for doing yow; job in such a careful and courteous manner. We thank you for helping us in making this process as simple as possible for the residents. We look forward to maintaining a relationship with Blue Chip, and intend to continue to utilize your services with any future pest-control needs. It is my pleasure to recommend the reliable services of the Blue Chip Pest Control Service, Inc. of Huntington Beach. Our establishment has retained the services of Blue Chip for the past five years and we have been very pleased with their work to date. Their thoroughness and professionalism have not only earned our satisfaction but our respect as well. Our current technician, Carl Patterson, has met all of our expectations for efficient and reliable service and has come to be a person we can depend on. I have known, and known of, Mr. Chuck Chen of Blue Chip Pest Control since 1986, both professionally and personally. In the Real Estate/escrow Transaction(s) that I have handled wherein Mr. Chen was the Termite Company hired, the report(s) and work performed was of the quality of a true professional. Personally, I have always known Mr. Chen to be of the highest Integrity which one cannot always say about all people one knows. I hope that you will take this letter into consideration whichever the situation, either personally or professionally. 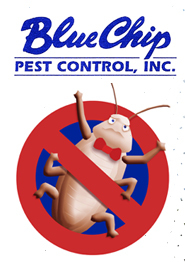 Blue Chip Pest Control, Inc., (800) 229-2888, (714) 375-1688, (626) 308-0887, (562) 947-7185, fax (714) 375-0888, info@bluechippestcontrol.com | Base Content Copyright © 2019 Market Hardware, Inc. | Additional text content Copyright © 2019, Blue Chip Pest Control, Inc.